LONGTIME WITCHBLADE TEAM RON MARZ & STJEPAN SEJIC RESHAPE THE TOP COW UNIVERSE! 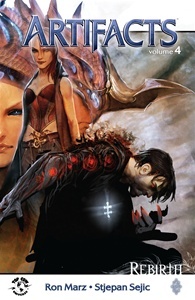 In this introductory-priced volume, the longtime WITCHBLADE team of RON MARZ and STJEPAN SEJIC unveil the new shape of the Top Cow Universe. Former priest and current FBI profiler, Tom Judge, can't shake the feeling that something is horribly and inherently wrong with the world. He blames it on past trauma, but a new investigation of gangland violence linked to mobster Jackie Estacado will reveal he may very well be right... and setting things right may destroy everything. Featuring a complete cover gallery alongside a host of bonus content and extras, this collection is a must for anyone curious about Top Cow's REBIRTH!